Despite the iPhone’s own note-taking application, I’ve been noticing a number of web apps emerge which emerge that duplicate the functionality and add the incentive of being able to host and access those notes from the web. PogoNotes is perhaps the best example I’ve come across so far. The application comes with a simplistic interface which displays the title of your notes, an “Options” button with a host of different settings, and the ability to instantaneously create a ‘PogoNote’ with the + button in the top right-hand corner. Needless to state the obvious, the application is accessible with any device that can access the web, but it’s awesomely done AJAX functionality looks best suited for the iPhone. 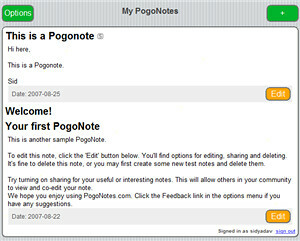 Apart from being a simple note-taking device, PogoNotes also enables you to publicly share your notes and add a password to them, and something I love, add them into public groups as well as search by ZIP code (hello, note sharing on campuses? 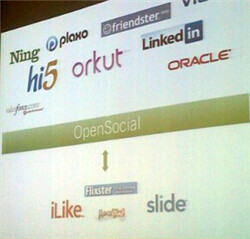 ), username, and keyword. If you own an iPhone, you gotta give PogoNotes a try — I can see a number of instances where such a utility will prove useful.